Instructor User Guide Tests and QuizzesHow do I create a new assessment using markup text or cut and paste? Enter a title for the assessment. Choose the Create using markup text radio button. 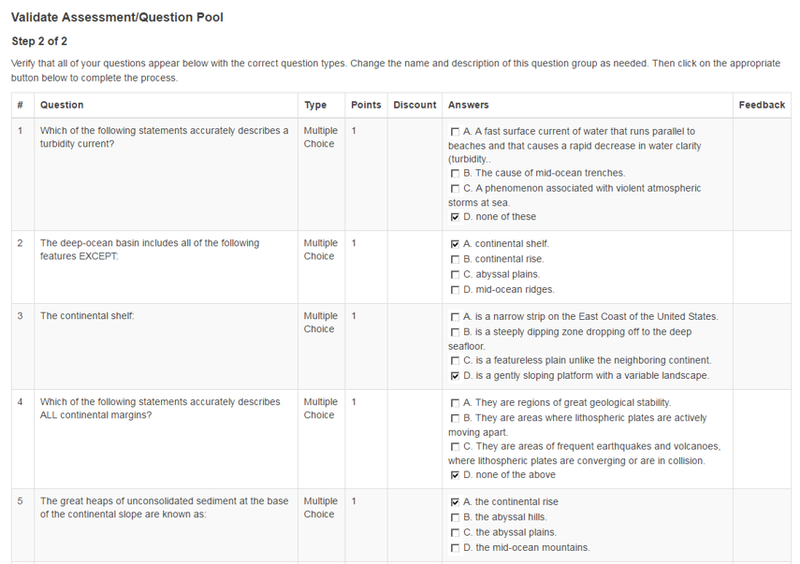 In this screen, you will see fields for the name and description of the your assessment, and for the questions. Enter your questions into the questions window and then click Next. 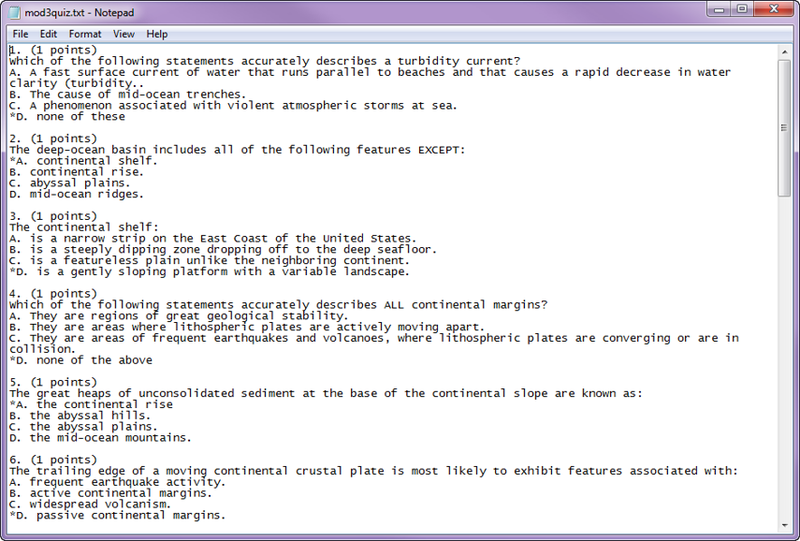 Note: Your questions must be written in a specific format. Refer to the "Instructions and Examples" shown on this screen for the correct format. Write your questions in advance. Zoom: Write your questions in advance. Tip: You may find it convenient to prepare questions in advance and then copy and paste them into the question area. Refer to the mark-up text format required and then type up your questions in a text editor. 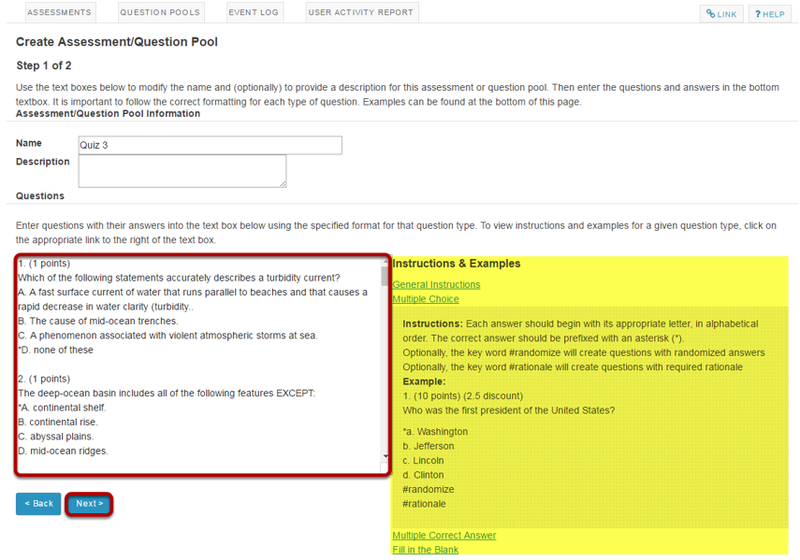 Then, copy and paste your questions into the markup text area. Check that your questions meet your expectations. If everything looks correct, click Create Assessment to create a new assessment. You may now make further changes as described in How do I create an Assessment (i.e. Test or Quiz)?, starting from "Add a question." Tip: Remember that you still need to publish your assessment before students can view and submit it. Prev: How do I create an assessment in Tests and Quizzes? Next: FAC - T&Q - How do I set up Respondus Lockdown Browser for an assessment?